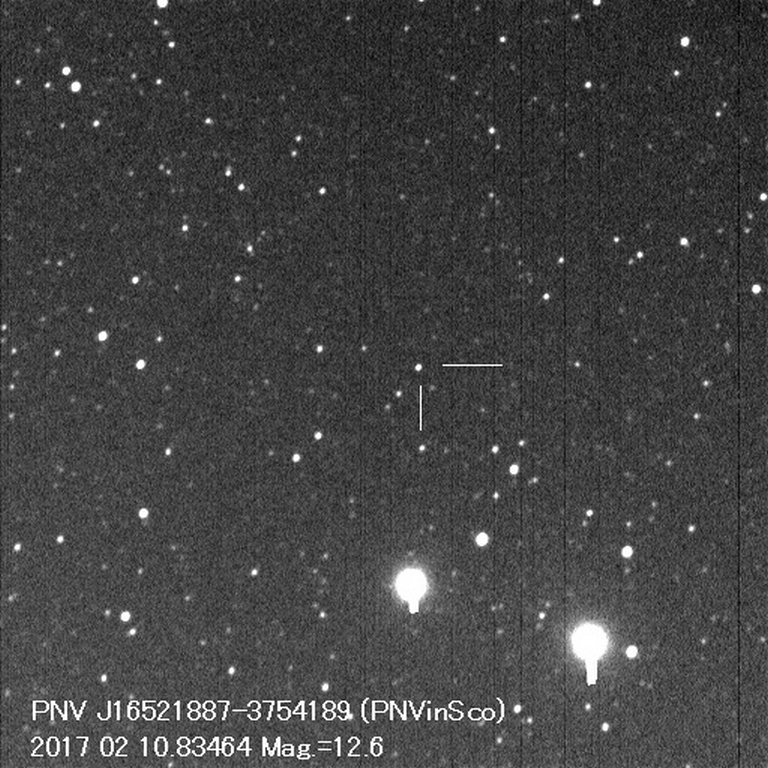 Spectra: Spectroscopy indicating that PNV J16521887-3754189 is an He/N nova was obtained 2017 February 12.3 UT by J. Strader (Michigan State Univ.) et al. (ATel #10071 ). Charts: Charts with a comparison star sequence for PNV J16521887-3754189 may be created using the AAVSO Variable Star Plotter (VSP ). Be sure to include the hyphen and space in the name, as shown. Submit observations: Please submit observations to the AAVSO International Database using the name PNV J16521887-3754189. Once a GCVS name is announced in an IAU Circular or CBET, please use that name. a. Designated PNV J16521887-37541890 when posted to the IAU Central Bureau for Astronomical Telegrams Transient Object Confirmation Page (TOCP) at http://www.cbat.eps.harvard.edu/unconf/tocp.html . Most of the information in this Alert Notice is taken from the TOCP page or ATel #10071 (http://www.astronomerstelegram.org/?read=10071 ). b. H. Nishimura reports nothing is visible at this location on his frames taken before 2017 Jan. 25.872 UT. 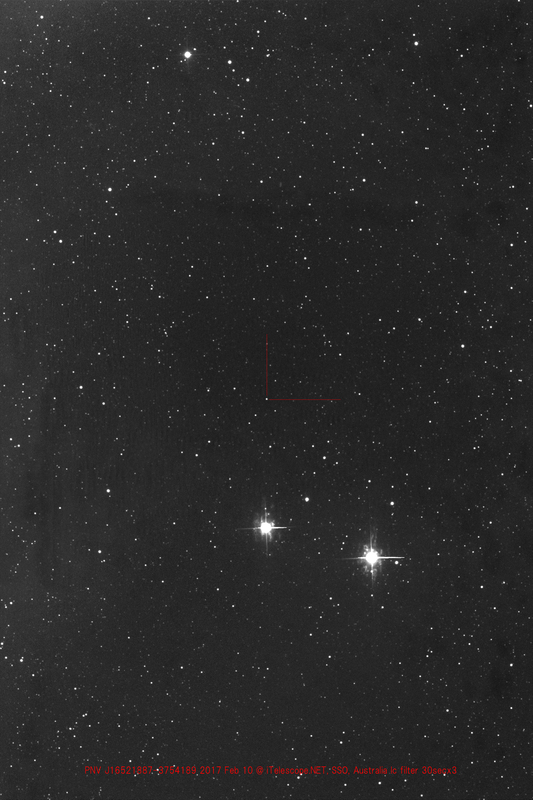 - S. Kiyota (Kamagaya, Japan, 2017 Feb. 10.7018 UT, remotely with 0.50-m f/4.5 CDK astrograph + FLI PL6303E at iTelescope.NET, Siding Spring Observatory, NSW, Australia): 18.63s, 16.44". - T. Noguchi (Chiba-ken, Japan, 2017 Feb. 10.835 UT): 18.66s, 16.7". - H. Nishimura notes in his discovery report that there is a red star within several arc seconds of the nova. - T. Noguchi (Chiba-ken, Japan) reports there is a star (mag. 15.9) at same position on DSS (1995). - P. Schmeer (Bischmisheim, Germany) reports that "the 'red star within several arc seconds' is only about 0.3" from the positions reported by S. Kiyota and T. Noguchi, respectively. Magnitudes for this star from several catalogues: USNO-B1.0 0520-0568078 (R1= 15.04, B2= 18.54, R2= 15.86, I= 12.46), GSC2.3 S8V6023335 (F= 16.30, j= 20.16, V= 16.97, N= 13.14), 2MASS J16521864-3754166 (J= 10.282, H= 9.104, K= 8.596), WISE J165218.64-375416.5 (W1= 8.437, W2= 8.399, W3= 7.954, W4= 7.950)". -P. Schmeer also notes the nova is only 6.7' north of miu2 Scorpii (V= 3.6 mag).